Rather than attempting to reproduce a scene exactly as we see it, enduring photographs reveal unseen aspects of our world. Capturing this hidden world requires understanding and mastery of photography’s “creativity triad,” the three aspects of a scene that distinguish the camera’s vision from human vision: motion, light, and depth. Light is arguably the single most important element in an image. And the way a camera handles light may very well be photographers’ single biggest frustration—while our eyes can pluck detail from the deepest shadows to the brightest highlights, with a camera we can have shadows, or we can have highlights, but we can’t have both. Photographers go to great lengths to mitigate the shortcomings of their camera’s dynamic range (range of light a camera can pull detail from in a single frame, from shadows to highlights): Artificial light, blending of multiple exposures, and graduated neutral density filters absolutely have their place, but we often overlook the opportunity limited dynamic range provides. In my previous post I wrote about how the camera’s ability to accumulate light over the duration of a single frame can reveal motion that’s invisible to the naked eye. Where light is concerned, while many see it as a limitation, I see my camera’s “limited” dynamic range as an opportunity to hide distractions and emphasize features. Whether it’s a Yosemite silhouette that emphasizes shape, or a high-key autumn image that highlights color, narrow dynamic range doesn’t need to be a handicap. Last week I was in Zion National Park, co-teaching Don Smith’s workshop there. Zion’s yellows were peaking while we were there, but most of its red maples were about a week past prime. Nevertheless, I was able to find enough crimson leaves to keep me happy. One morning I found a group of leaves dangling away from most of the tree. Seeking the best way to isolate the leaves from their surroundings, I experimented with different positions and focal lengths, starting with a half dozen or so leaves against a background of soft-focus branches and leaves. I love my new Sony 100-400 GM lens for isolation shots like this and had fun composing these leaves with a variety of focal lengths. The longer I worked on the scene, the more my eye was drawn to the shape, crimson translucence, and vein pattern of one pair of leaves in particular. Suddenly, simplicity was the operative word. Strategizing the best way to separate these two leaves from their surroundings, I quickly realized a background of more leaves and branches, no matter how soft, was too distracting. But most angles that eliminated background foliage blended my my leaves into Zion’s towering red sandstone walls. Eventually I found a position far enough beneath the tree to put the backlit leaves against the cloudy sky. Though my Sony a7RII has enough dynamic range to capture the entire range of light from shadows to highlights (with a little help from Lightroom/Photoshop, pulling up the shadows and down the highlights), I found the texture in the clouds almost as distracting as the branches. Instead, I metered on the leaves, which, though nicely backlit, were nowhere near as bright as the sky. My histogram showed that I’d clipped the sky, which I knew would put my leaves against a white background. With no background detail to blur, I was able to stop down to f/16 and expand my depth of field to get more of both leaves in focus. The downside of this stop-down decision was significantly less light on my sensor, necessitating a longer shutter speed to achieve my desired exposure. For a shutter speed that overcame a breeze wiggling the leaves, I bumped to 1600 ISO. While my plan at capture was to put the backlit leaves against an entirely white background, when I started processing the image, I realized I’d captured a patch of blue sky (revealed by pulling the Lightroom Highlights slider to the left). I decided to keep blue sky while still hiding the texture in the clouds in the “blown” highlights. The human experience of the world unfolds like a seamless movie of continuous instants, while a camera accumulates light throughout its exposure to conflates those instants into a single frame. Last week in Yosemite I got an opportunity to play with motion while photographing autumn leaves blanketing nearly every exposed surface below Bridalveil Fall. Beneath the fall Bridalveil Creek splits into three branches I love to explore—up- or down-stream, it doesn’t matter—searching for more intimate scenes. Last week I stayed close to the trail—not by design, but because I found enough to occupy every available minute. Most of the fallen leaves had come to rest on granite, but those that had landed on the creek had been instantly swept downstream until they came to rest in sheltered pools, pushing up against and accumulating the rocks that bounded the pool. I found some pools that were entirely covered with leaves of varying shades of yellow and (just a little) green. This little scene was downstream from the third bridge. The leaves here had been accumulating in this pool for a few days, leaving it more than half covered on this my final day in Yosemite. More than the golden pool, what really drew my attention from the bridge was a small collection of leaves, soon to become part of the pool’s autumn mosaic, swirling in a slowly spiraling current. I set up my tripod right on the bridge, pulled out my new Sony 100-400 GM lens, dialed my polarizer to minimize reflections, and went to work. Because so much was happening in the scene, I started toward the lens’s wide end, but quickly found myself tightening each composition until I got down to a version of what you see here. Once I had my composition, it became all about the motion in the leaves. When photographing landscape subjects in motion, each click can render a completely different image, so I’ve learned to never stop at one (or two, or three…). Whether it’s ocean waves, churning whitewater, or spinning leaves, I always make sure I have a variety of motion effects from which to choose. In this case, while the leaves were spiraling in a fairly consistent current, it seemed that with each rotation at least one leaf would go rogue, either slowing, accelerating, or making a break for the perimeter. The result was a distinctly different spiral with each capture. I experimented with shutter speeds between ten and thirty seconds. Sometimes I’ll use a neutral density filter to stretch my shutter speed, but for this scene I was using a polarizer (minus two stops), it was quite early (shortly after sunrise) in an always densely shaded location, and darkened even further by the dense clouds of an approaching storm. In other words, the scene was dark enough that I could get the shutter speed all the way out to thirty seconds with my f-stop and ISO settings. When I was done, I had about 20 frames to choose from (one more argument for the tripod), identical except for a little different swirl. While a still camera can’t capture motion as humans view it, in the right hands the camera absolutely does capture motion in ways that I’d argue can be even more appealing than being there. In this case, the spiral nature of this pool’s motion is much more apparent in this image than it was witnessing it firsthand. I recently started rereading Ansel Adams’ “Examples: The Making of 40 Photographs,” a book I’d recommend to anyone interested in the thinking side of photography. Though much of the book covers equipment and techniques that are irrelevant to today’s digital photographer, Adams’ words reveal a vision and mastery of craft that transcends technology. Like him or not (I do! ), you can’t deny that Ansel Adams possessed an artist’s vision and an ability to convey that vision in ways the world had never seen. Another takeaway from the book is Adams’ clear disdain for pictorialism, a more abstract approach to photography that (among other things) uses the camera’s unique vision to interpret the world in ways that are vastly and intentionally different from the human experience. Preferring instead the more literal front-to-back sharpness of the f/64 group that became his hallmark, Adams had little room for pictorialists’ soft focus and abstract images. I, on the other hand, love using limited depth of field to emphasize my primary subject and disguise potential distractions. When we explore the world in person, our ability to pivot our head, move closer or farther, and change perspective allows us to enables us to lock in on a compelling subject and experience the scene in the way we find most meaningful. But an image is a constrained, two-dimensional approximation of the real world as seen by someone else. The photographer shares his or her experience of the scene by guiding our eyes with visual clues about what’s important and how to find it. This reality wasn’t lost on Ansel Adams. Despite his distaste for soft focus techniques, Adams guided viewers of his images with in other ways, particularly his use of light. He knew that the camera and human eye handle light differently, and used every trick at his disposal, both at capture and in the darkroom, to leverage that difference. At the risk of initiating a debate about the relative merits of the two techniques, I’ll just say that I’m a fan of both and am not afraid to apply whichever approach best suits my objective. And I suspect that if Ansel Adams were photographing today, he would be taking full advantage of the creative possibilities created by today’s technology. Last October I was exploring the aspen grove at the end of the Lundy Canyon road near Mono Lake. With fall color peaking I put extension tubes on my Sony 70-200 f/4 looking for subjects that I could get close to, but with a distant enough background to maximize focus contrast (sharp/soft). I’ve always felt that soft focus aspen make a great background, but they need to be soft enough that individual leaves and trunk detail don’t distract. I started looking for dangling leaves, either individual or bunches, but soon turned my attention to stark white aspen trunks that stood out in striking contrast against the distant wall of yellow leaves. I soon zeroed in on this trunk for its well-spaced knots, gentle curve, and clean, textured bark, plus the nice assortment of parallel trunks at varying distances in the background. This frame I shot wide open at the closest possible focus distance to get the softest background focus. To emphasize the white trunks, I exposed the scene as bright as I could without clipping the highlights in the primary trunk. On my camera’s LCD at capture this image looked pretty much as you see it here, and required minimal processing. A regrettable reality of my life is that the best conditions for photography are usually the absolute worst conditions to be outside. Fortunately, I’ve been hardened by decades of San Francisco Giants games at Candlestick Park, the coldest place on Earth. As a photographer, I continue to embrace my mantra for warmth at the ‘Stick: Too much is always better than not enough. For me it’s all about layers: silk, wool, down, and Gore-Tex. I start winter mornings with wool socks, waterproof boots, silk long-johns (if it’s extremely cold), flannel lined jeans, wool long-sleeve undershirt, wool Pendleton or lined cotton shirt, vest, down jacket, gloves (I have a variety from thin to thick), neck gaiter, and a hat or band that covers my ears. I add and remove layers as conditions dictate, and don’t always wear everything, but I’m never too far from this stuff in winter. And if it’s raining or snowing, I add waterproof pants, a waterproof parka, waterproof boots, and a wide-brim waterproof hat to keep myself dry, freeing my umbrella to keep my gear dry while shooting. The basic clothes I pack in my suitcase before each trip, but the gloves/hats/umbrella etc. are in a gym bag that is always in my car. In the car I also keep an extra pair of shoes and socks, towel, and garbage bag (to cover my camera when it’s on the tripod). With all this paraphernalia, I’m nice and toasty in whatever extremes the winter throws at me, and I can never use weather as an excuse for missing a shot. On a very chilly morning in late October, my workshop group had wrapped up the sunrise shoot and was heading to breakfast when we passed Leidig Meadow beneath a thin veneer of fog. Knowing that the group was cold and hungry, I kept going, but in the cafeteria parking I polled everyone and found that while about half were ready for warmth and a hot breakfast, the other half wanted to return to photograph the meadow. They got no argument from me. In normal conditions this wouldn’t have been possible because Yosemite’s primarily one-way traffic flow would have required a 20-minute loop to return to this spot, and the fog would likely have been long gone. But this year, extensive roadwork had caused the National Park Service to make every open road two-way, and we were back at Leidig Meadow in two minutes. Yosemite’s radiation fog can come and go in seconds (I crossed my fingers that it hadn’t dissipated in the five minutes since our original drive-by), so as soon as we parked the group grabbed their gear and scattered. Wanting a foreground that was more than just meadow grass, I ran for this downed tree that I’d seen on an earlier visit. We only got about five minutes of quality shooting in before the fog was gone. All of my shots were some variation on this composition using the log anchoring the bottom of scene, and Half Dome framed by the nearby trees on the left and distant yellow cottonwoods on the right. 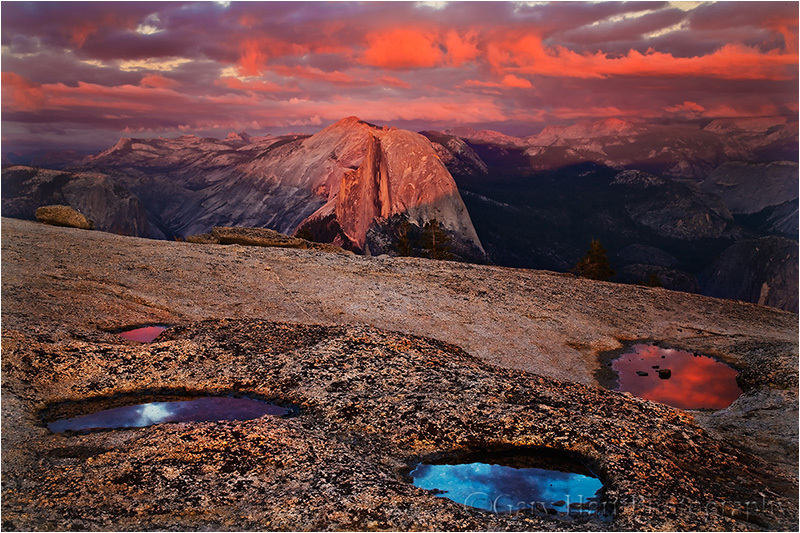 To maximize my focal length and make Half Dome larger, I moved back as far as I could without losing my framing. The horizontal trunk was far enough away that I was able to achieve depth of field all the way to infinity when I focused there. Today is Nature Photography Day. Of course every day is Nature Photography Day in my world, but if designating a day to remind everyone the joys of photographing nature helps drive people outdoors with their cameras, I’m all for it. Nature photography can be enjoyed in many forms. For some it’s simply the passive act of viewing images that inspire vicarious travel or that rekindle happy memories; for others nature photography takes a more active as an excuse to get outside or an opportunity to explore. The stakes are higher for those of us who make our living with our images. Our ability to get outside and explore is tied to our ability to create images that touch others. For me that starts with finding scenes that touch me, then trying to find ways to convey them that will resonate with others. My process is rarely a simple click. Once I’ve identified a scene, I devise a plan for the best way to organize and emphasize the significant elements, then get to work with a series of clicks that continue until I’m satisfied (or decide there’s no image to be had). The first click is like a writer’s draft, and subsequent clicks are revisions. After each click, I stand back and evaluate the image on my LCD, refine the variables (exposure, relationships, focal length, depth of field, focus point), click again, then repeat as necessary. I find this approach particularly valuable in macro and close-focus images, intimate scenes where even the slightest adjustment in composition, depth of field, and focus point can dramatically alter the result. It’s the primary reason I’m such a strong tripod advocate (evangelist)—when I’m done evaluating, the shot I just evaluated is sitting right there on my tripod, waiting for me to apply the adjustments I deem necessary. I often look for a leaf, a flower, a rock, a place for my viewer’s eye to land, and try to isolate it from the rest of the scene. In the above image, captured several years ago in an aspen stand in the Eastern Sierra west of Bishop, I had a pretty good idea what I wanted to do and was quite content just exploring in the peace of a solitary autumn morning. When I found this collection of four vertically stacked leaves knew immediately I’d found what I was looking for. Starting with my 70-200 lens and a 25 mm extension tube, I set up my tripod with the leaves suspended in front of a receding line of bleached aspen (they’d have been lost against the background foliage) and played with the framing until I was satisfied—vertical orientation, fairly tightly composed. Exposure was straightforward in the soft overcast, and a neutral polarizer helped the color come through the leaves’ waxy sheen. Though I settled on the general framing pretty quickly, an intermittent breeze meant I still had some decisions to make. The breeze ranged from light to apparently nonexistent, but I increased my ISO to 400 to enable a faster shutter speed and prevent my camera from picking up micro-movement I couldn’t see. I timed my clicks for pauses in the breeze. Though I don’t always catch compositional balance, relationship, and border problems immediately, after several click/evaluate/refine cycles I felt I had the composition nailed. But that was only the first step. I wanted the leaves sharp, with the receding trunks soft but recognizable. I don’t trust critical depth of field decisions made in camera, so when an important composition (one I really like) relies heavily on DOF and focus point, I always take a series of frames, bracketing my f-stop around the DOF I think is best. Sometimes I’ll range all the way from f2.8 to f22. In this case I tried frames ranging from f4 (my 70-200’s fastest aperture) to f16 (at f16 I increased my ISO to 800), in one-stop increments. Since I thought f8 would give me about the right combination of sharp foreground and soft background, I even took a couple of extra frames in 1/3 stop increments around f8. Back home on my large monitor I scrutinized each frame closely and ended up choosing this one at f7.1. In Lightroom I warmed the image slightly to remove a blue cast on the white trunks. Because I intentionally underexposed the scene a little at capture (to ensure that I didn’t clip any of the red channel, where most of the yellow is), in Photoshop I dodged the trunks to remove the dinginess introduced by my underexposure. Otherwise my processing was pretty much standard stuff—a subtle wiggle in Curves to add contrast, Topaz noise reduction, and selective sharpening of everything in focus with Unsharp Mask. I’m pretty happy with this image, probably happier with it than the attention it generates. But that’s okay because every time I look at it I remember how much fun I had out there in the woods that chilly autumn morning. A few days ago Sony asked me to write a couple of small pieces on “my favorite landscape lenses.” Hmmm. My answer? My favorite lens is the lens that allows me to do what I need to do at that moment. In fact, to avoid biasing my creativity, I consciously avoid approaching a scene with a preconceived notion of the lens to use. What I mean is, when I charge into a scene too committed to a lens, I miss things. And “favorite” tends to become a self-fulfilling label that inhibits creativity and growth. Rather than picking a favorite, I’m all about keeping my mind open and maximizing options. Because the focal range I want to cover whenever I’m photographing landscapes is 20-200mm, the three lenses I never leave home without are my Sony/Zeiss 16-35 f4, Sony/Zeiss 24-70 f4, and Sony 70-200 f4. I have other, “specialty” lenses that I bring out when I have a particular objective in mind. For example, my Tamron 150-600 when I’m after a moonrise or moonset, or my Rokinon 24mm f1.4 when the Milky Way is my target. And even though I have a bag that will handle all of these (plus three bodies, thank you very much Sony mirrorless), I need to weigh the value of lugging lenses I probably won’t use against inhibited mobility in the field. There are a lot of qualifiers for these numbers—for example, the total may be skewed a bit for the 24-70 as it is the lens I use most for lightning photography, and when my Lightning Trigger is attached and an active storm is nearby, it can go through hundreds of fames in a relatively short time (even when I’m not seeing lightning). Also, since getting the Tamron 150-600, I sometimes used that lens as a substitute for the 70-200, something I virtually never did with Canon and my 100-400 (which I didn’t particularly like). And I haven’t used the Zeiss since getting the Rokinon, so I really could lump those two together. What does all this mean? I don’t know, except that I have a fairly even distribution between wide, midrange, and telephoto. That’s encouraging, because I never want to feel like I’m too locked into a single lens. But two things in particular stand out for me: the high number of 16-35 images, and the low number of 70-200 images. The 16-35 number is significant only in comparison to my Canon 17-40 and 16-35 numbers from previous years, which were much lower (especially for the 17-40). Wide angle clicks went up quite a bit when I replaced my Canon 17-40 (which I was never thrilled with) with the Canon 16-35 f2.8 (which I liked a lot more). But I don’t think they were as high as they are with my Sony/Zeiss 16-35, which is probably a reflection of how pleased I am with the quality of those images, combined with that lens’s compactness. The jury is out on whether it signals a transition in my style, but it’ll be worth monitoring. The most telling statistic to me is how few 70-200 images I took. I really like the lens, so it’s not a quality thing. And as I said earlier, some of that is an indication of how much I enjoyed shooting with the big Tamron, but that’s not the entire answer. My Canon 70-200 f4 was one of my favorite lenses, and I always enjoyed using it to isolate aspects of a scene, and maybe I’m not doing that so much since my switch to Sony. So here’s a goal for 2016: Don’t forget the 70-200. Stay tuned…. 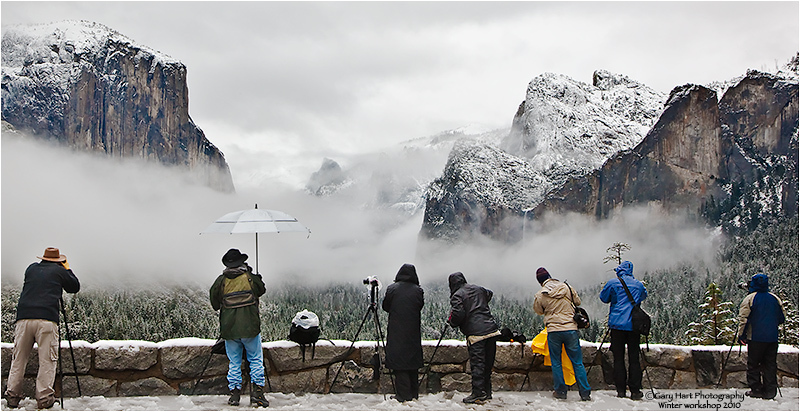 This is another image from my recent Yosemite snow day. It’s just another example of how much I enjoy photographing Yosemite when its seasons are changing—either snow with autumn leaves, or snow with spring dogwood and waterfalls. On this chilly, wet morning, during one of the breaks when the clouds lifted enough to expose Yosemite’s icons, I was at a spot above the Merced River with a nice view of El Capitan. I like this spot for the dogwood tree I can align with El Capitan, and because it’s not particularly well known. I found it about ten years ago while wandering the bank of the Merced River looking for views (something I encourage anyone who wants to get serious about photographing Yosemite to do). I tried a few different things here, starting with closer compositions using my 70-200 and 24-70 to highlight the snow on the leaves with El Capitan in the background. I eventually landed on this wide angle view that used the snow-dusted dogwood tree to balance a more prominent El Capitan. Because the opening is narrow here, I struggled with how to handle the tree on the left. I eventually decided, rather than featuring it or eliminating it, to just let its textured trunk frame the scene’s left side. Sharpness throughout the frame was essential. With the trunk less than three feet away, the depth of field benefit of shooting at 16mm was a life-saver, giving me front-to-back sharpness at my preferred f11 (the best balance of DOF, lens sharpness, and minimimal diffraction)—as long as I focused about five feet away. Focus handled, my next concern was the breeze jiggling the leaves. At ISO 100, my shutter speed in the overcast, shaded light was 1/20 second; increasing my ISO to 800 allowed a much more manageable 1/160 second. Click.